Let me be right up front. I am a "flaming heterosexual". Nevertheless, I am concerned, worried, and sometimes outraged at the discrimination against homosexuals. For crying out loud, why can’t we all just get along? As I mull over the various things I’ve run across in the past months of blogging, I have found some incredibly stupid and sometimes shocking behaviours towards a segment of our society which is differentiated from everyone else based on one silly thing: their sexual orientation. This isn’t a sign of the Four Horseman of the Apocalypse folks. The Westboro Baptist Church led by one Fred Phelps (see God Hates Fags) has become famous – or should I say infamous – for its most unusual protesting done throughout the United States. They picket the funerals of dead soldiers with signs reading things like "God hates fags" and "Thank God for dead soldiers". Their ludicrous anti-homosexuality stance is based on the idea that the ills of the United States and the world are all due to an acceptance of gays. Just outside of Toronto, Canada, this separate school board (see The Halton Catholic School Board: a "gay" anachronism) has refused to permit Gay-straight alliances in their schools. (Definition: Gay-straight alliances are student organizations that are intended to provide a safe and supportive environment for lesbian, gay, bisexual, and transgender (LGBT) youth and their straight allies (LGBTA).) The chair of the board, Alice Anne LeMay, was quoted as saying, "We don’t have Nazi groups either. Gay-straight alliances are banned because they are not within the teachings of the Catholic Church." It’s comforting to know that the Roman Catholic Church is against Nazis. Senator Stacey Campfield of the Tennessee Legislature has managed to successfully get passed his bill to exclude the teaching of homosexuality from kindergarten to grade eight. This bill which has become known as the "Don’t Say Gay Bill" was passed in a modified form which reads "any instruction or materials made available or provided at or to a public elementary or middle school shall be limited exclusively to natural human reproduction science." The original version was "no public elementary or middle school shall provide any instruction or material that discusses sexual orientation other than heterosexuality." If we don’t talk about an issue, will it just go away? I think about the sonnet written by Emma Lazarus engraved on a plaque mounted inside the Statue of Liberty and associated with the immigrants coming to America. The poem reads in part, "Give me your tired, your poor, Your huddled masses yearning to breathe free…" Just as long as those masses aren’t gay. Senator Campfield has succeeded in enacting into law a policy of exclusion. Despite his work in a number of films, we are all going to have this gentleman engraved in our heads as Lieutenant Sulu from the original Star Trek series. George Takei is a very nice man and, incidentally, he’s also gay. Now not being one to shy from an issue, George has lent his name to an amusing counterattack to Senator Stacey Campfield’s Don’t Say Gay Bill. In the following video, George offers up his last name as a replacement for the word gay. – His last name is pronounced "tah kay" – If Tennessee won’t allow you to say, "I’m gay" then say, "I’m Takei". You can march in a Takei pride parade. June is the official month where we can all recognise the contribution of gay people everyone. I realise that the very fact I am saying gay people means that we collectively have a long way to go before our society arrives at a point where being gay per se is not seen as being different. I’m straight and nobody blinks an eye. Imagine if someday somebody could say, "I’m gay" and nobody bats an eyelash. In Toronto, my home town, Gay Pride Week (okay, 10 days) is celebrated from Friday, June 24 to Sunday, July 3 with numerous events happening across the city. The culmination of the festivities is the Annual Gay Pride Parade on July 3rd at 2pm which, by the way, has turned into a family event. I repeat a "family" event. Wow, just imagine how far we’ve come. George Takei makes an excellent point when he says that by not talking about gays, you can make gays go away. Bad decision. Senator Stacey Campfield’s efforts to sweep the issue the rug isn’t going to solve anything. Asher Brown, a 13-year old in Houston, Texas shot and killed himself in October 2010 after being subjected to anti-gay bullying. It is no fun being different and we as a society must do more to be inclusive, not exclusive. 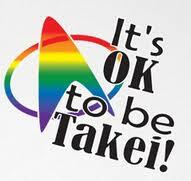 So, in light of Tennessee’s new bill and of George’s initiative, let’s all celebrate the start of Takei Pride Month. Pride Week is a ten-day event held in Toronto, Canada, during the end of June each year. It is a celebration of the diversity of the LGBT community in the Greater Toronto Area. It is one of the largest organized gay pride festivals in the world, featuring several stages with live performers and DJs, several licensed venues, a large Dyke March, and the Pride Parade. The centre of Pride Week is the city’s Church and Wellesley village, and both the Dyke March and the main Pride Parade are primarily routed along the nearby Yonge Street, Gerrard Street and Bloor Street. Pride Toronto’s 2011 festival will showcase a month of events, both official Pride events as well as Affiliate Events run by our partners in Pride. Our festival week begins on Friday, June 24th and continues through to Sunday July 3rd 2011. The Senate approved, 19-11, a modified version of Sen. Stacey Campfield’s bill to block teaching about homosexuality in kindergarten through eighth grade. In an interview, Campfield said the new version accomplishes the same objective as the original – ensuring that parents, not teachers or others coming to classrooms, make decisions on when children learn about sexuality and what they learn. "There’s more than one way to skin a cat," he said. "This skins the cat, but doesn’t scare them (other legislators) so much."